3.44. office of ecological labour: surfacing deep correlation, performance environment. Despite Efficiency: Labour. 2 December 2014, Herbert Read Gallery, University for the Creative Arts, Canterbury. The internet can also be seen as an astonishingly massive ‘backgrounding’ machine which, while connecting some, in/visibilises innumerable other bodies. First of the massively opaque entanglements the internet successfully overcodes is energetic. Quite weirdly, relatively little information is available about the energy use of the world wide web1. Are we hiding behind the complexity of our own making? Or, who is hiding behind whose complexity?2 The internet is one of those networks or systems that is too complex to be comprehended from the human viewpoint. IT companies have been taking great steps towards green data centres3, but only imagining distances that data travels in order to visualise a single web page brings about vertigo. Energy and materials implicated stretch far beyond the plug in the wall. This standpoint implies a radical embeddedness in the Great Acceleration of resource extraction, but could this implication be harnessed towards better commoning with the atmosphere? 3.45. Saribus rotundifolius (footstool palms) and installation, office of ecological labour. Arguably, streaming a video online may be more energy efficient than buying a DVD. That is besides the point. I want to insist on the invisibilisation processes in act with each internet connection. Clearly, this is but the latest instantiation of commodity alienation via supply chains by which the potatoes in the dish do not bear the marks of the farmers. The internet merely upscales and smooths out the game. There is a quantitative shift inasmuch it is globality that is interpellated but there is also a deeper epistemic modification. A key semiotic-material entanglement of the internet with the material reality is encapsulated in ‘data’, which is made of very actual molecules. The materiality can be best observed in the case of ‘big data’, the accumulation of unprecedented amounts of data through search engines, digital sensing, etc. Materially speaking, big data requires immense resource expenditure both to gather and analyse, such that it creates novel types of concentration of power in hands of a handful of companies and governments (as Snowden leaks in 2013 revealed). On the semantic side, big data revolution brings the promise of supplanting any theory or decision-making in favour of a mathematical analysis of relations between data streams. The conceptual/mathematical mechanism upon which big data phenomenon is premised is that of ‘correlation’. Statistically speaking, correlation is a function that determines to what extent two variables are associated, thus indicating the level of dependence among them. But, as a fundamental statistician axiom admonishes: “correlation does not imply causation”4. Big data is closely wedded with correlation because it is an efficient method to squeeze out some meaning from the growing volumes of data gathered. However, reliance on big data has profound epistemic consequences (see: boyd and Crawford, 2012). In a boosterist article in Wired, Chris Anderson even announced “the end of theory”, because “with enough data, numbers speak for themselves” (2008). Correlation, ecologically speaking, is a scaling-up of reduction of complex process to relatively linear causal linkages among them based on a set of measurements and pre-established parameters. 3.46. office of ecological labour. Performance documentation, video still. Video: Louisa Love. Materially speaking, big data re-organises labour patterns in new ways that often seem to limit the worker’s rights. Beneath the more well-known digital labourers at the front-end of IT companies, there is also a ‘digital precariat’, workers who perform lowly paid activities that feed the data economy5. Through radical upscaling of computing, big data companies are able to atomise labour to the advantage of the employer, a phenomenon called ‘mechanical turking’ or ‘crowdworking’. It is cheaper to hire humans to perform some analytical tasks than it is to program computers. Amazon calls them ‘Human Intelligence Tasks’. Some examples are transcribing an interview, as speech recognition softwares are still lagging in this area; translation; pattern detection in images, etc. Crowdworking online markets are particularly harsh for the hired workers, whose rights are basically next to none; the pays are low, and the payers are not required to register any taxes. Crowdsourcing seems to multiply ‘digital divides’6. Especially significant is that crowdworking seems to recruit mostly women workers or workers from or based in Third World countries (Marvit, 2014). These modalities of ‘employment’ have been massively expanded over the past years with the explosion of platforms such as Uber, TaskRabbit, and others. Delimitations between affective, informational and physical work are being dissolved beyond recognition, or perhaps there never was a clear-cut distinction among these categories. 3.47. office of ecological labour. Performance documentation. In the networks of ICT, the backgrounding and objectification of work(ers) is at least threefold: power (energy sources), big data (correlation), and digital labour (crowdwork). These backgroundings with especial force push against the bodies of earth others (across the lithosphere, the biosphere and the atmosphere), and the humans on the lower side of the digital divide. Beyond the laconic truisms that the nature of ‘work is changing’, IT industry in important ways grows on the back and nurtures unequal divisions of labour and causes significant impacts on extra-human bodies. It is hardly possible to ‘demonstrate’ or ‘prove’ to what extent information networks impact upon the earth system, but it is at least ‘likely’ that they participate in the process. This constitutive doubt may be an invite to entangle more intimately with the naturalcultural processes that are beyond measurement. How to intra-act in more just ways within presently unobvious entanglements between informational pathways, humans and the atmosphere? The human-engineered networks are so deeply enmeshed with extra-human processes, that the point is not to accumulate more (connections), but to become occupied by what was ‘always already there’. This is what, i imagine, Donna Haraway intends when she asks that, in the times of the Chthlucene (her alternative to the anthropocene), we should ‘stay with the trouble’. 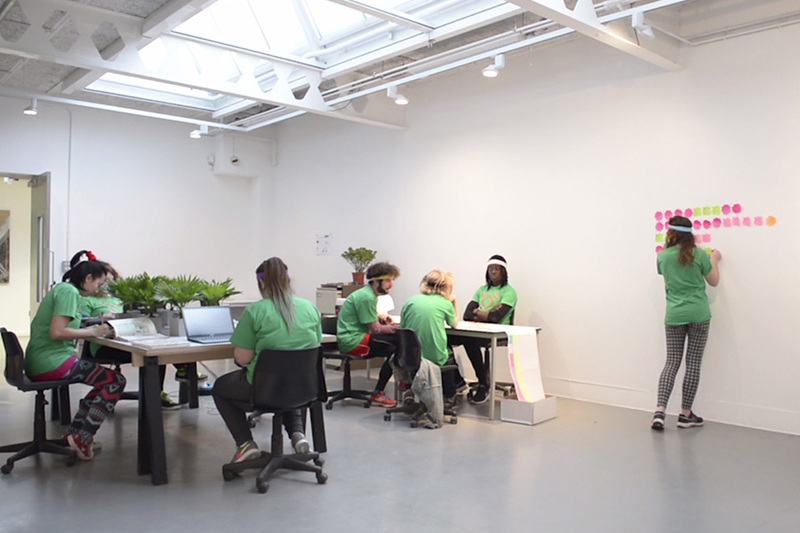 office of ecological labour (OOEL) is an attempt to situate and embody a connection between the use of the internet and greenhouse gas emissions on a local level. 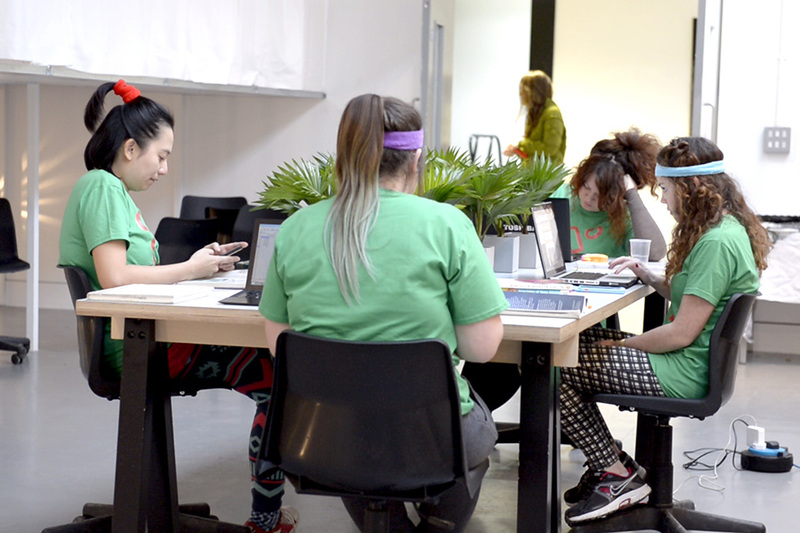 It was a participative group action in which a group of performers engaged in performing correlation between the local internet traffic on the University camps and the CO2 in the gallery space. The performance took place within the show Despite Efficiency: Labour curated by Emma Brasó, set up around the idea of inefficient work7. The performance was developed in collaboration with Brasó to relate to the educational and institutional context of the show and the University. Herbert Read Gallery, UCA Canterbury. Computers used on the campus were manufactured and shipped from many places. Correspondingly, the energy used to power the devices springs from various sources. Online connections made while surfing the web materially fire up other switches and connection points across the globe. The project tried to materialise these entanglements locally and, by doing so, to avoid the enclosures, first, of the screen, in order to foreground the bodies, and, second, by spilling over the internet infrastructure to tune into the planetary atmosphere. 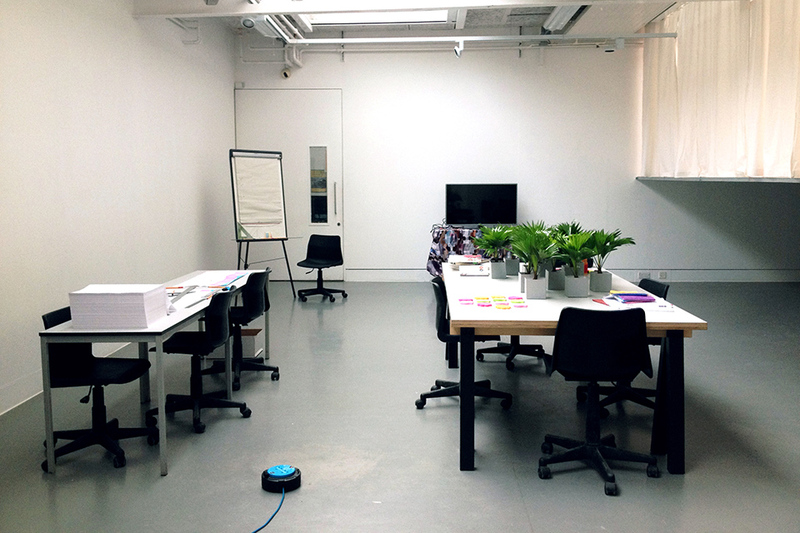 On 3rd of December 2014, at Herbert Read Gallery, the team of office of ecological labour (OOEL) performed a one-day test in which we produced, analysed, and performed a series of data translations with relatively simple means. The hypothesis was that there was an unresolved link between the volume of the internet traffic on the university campus, and carbon-dioxide concentration in the air of the campus. The correlation between elements needed to be modelled, estimated, if not guessed. OOEL was in pursuit of the carbon shadows of digital data. Following upon insights gathered in dancing ecologies and all that is air, this work further materialised the desire to slow down the ‘great acceleration’, to withdraw from the production of things or (immaterial) services, and create a territory of alternative naturalcultural practice that cannot be reduced to neither economy nor science. The intention was to test what it would take to create a small-scale team that would track, inefficiently, complex processes. 3.49. office of ecological labour. Video: Louisa Love. 2 December 2014, Herbert Read Gallery, UCA Canterbury. 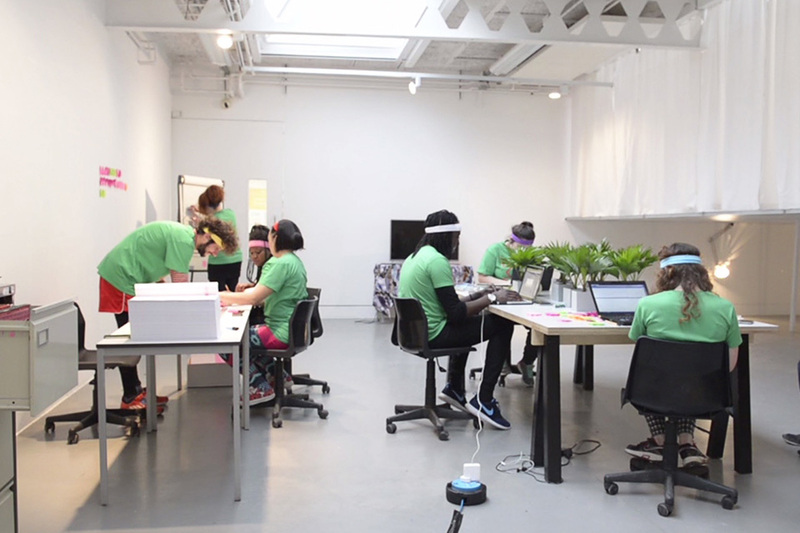 A number of human performers, together with plants and bits of technology, created a small-data machine for tracking the variation in the local internet use and the local carbon-dioxide levels. 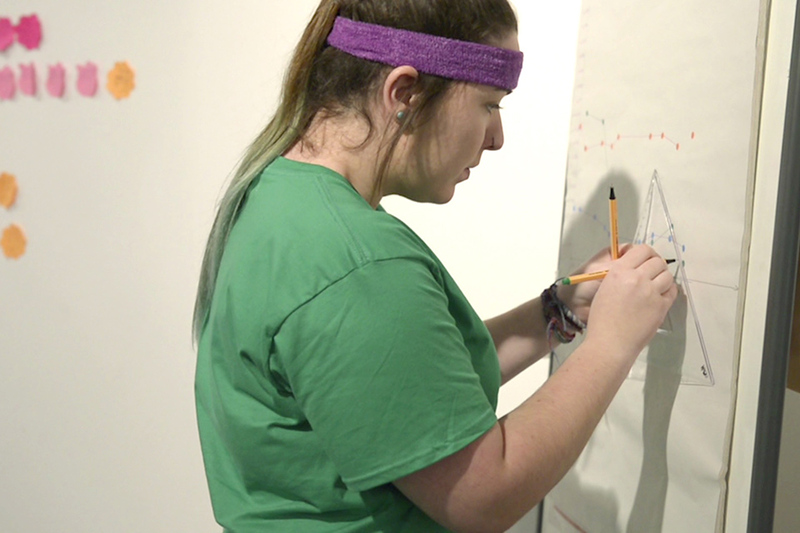 The performance included eight ‘work positions’: ‘intranet tracker’, ‘CO2 gatherer’, ‘cartographer’, ‘internet painter’, ‘CO2 painter’, ‘flip charter’, ‘correlationist’, and ‘public relationist’. Each of them, as the ‘job title’ says, was assigned a specific duty within an apparatus structured as a factory line. The intent behind this division was to heighten intra-activity among the performers, and to slow down the general proceedings, but it was also contextual, as i will explain in a moment. Lastly, the OOEL apparatus would have the goal of performative embodiment of the atmospheric-informational entanglement. The OOEL workers/performers were ‘recruited’ from the school. They were mostly Interior Design BA students that took part in designing the set-up of the exhibition. They were therefore already engaged with the show and the concepts behind it. However, this performance was outside of their learning duties, and they were not compensated. Because of this, it was important for me to find a way to make their ‘volunteering’ less invasive to their other duties. Hence i chose not to arrange any rehearsals, and instead to create a score that would be straightforward since learning would take place during the performance. Also, it was critical to achieve a balance between the intensity of the work and off-time. The previous experience with all that is air led to physical and mental exhaustion of everyone involved, not quite a slowed-down work. Lastly, the context was made familiar, class-like, aesthetically speaking and on the level of the score. OOEL was supposed to be more like a slightly odd workshop than a performance. 3.50. Plotting correlation, office of ecological labour. Performance documentation. 2 December 2014, Herbert Read Gallery, UCA Canterbury. ‘public relationist’ publishes the three variables (internet, CO2, correlation) via twitter and facebook (sitting on the right, fig. 3.51). 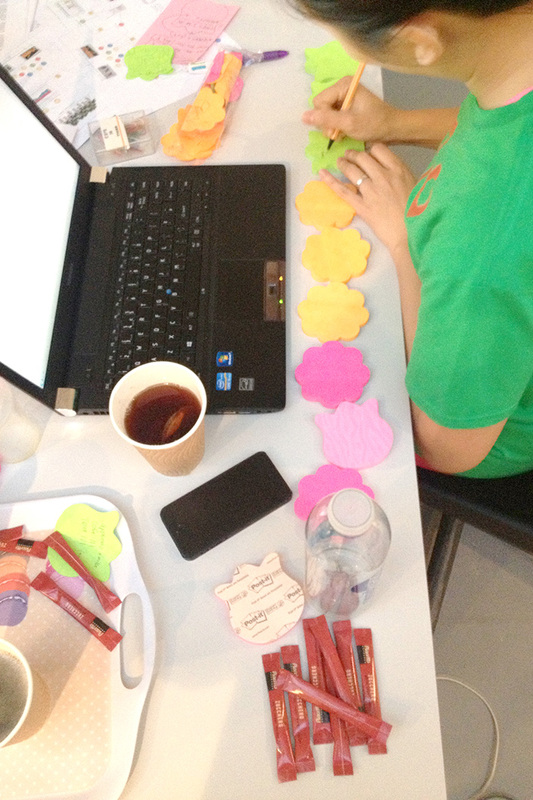 Each step was materially marked by the passage of the post-it note from one position to the next. 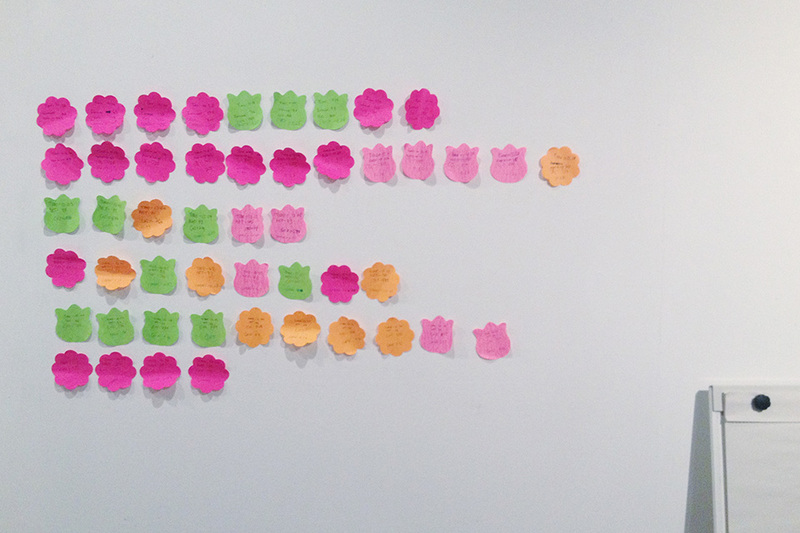 At the end of each round, the ‘public relationist’ would stick the post-it onto the wall (fig. 3.54). Then the ‘internet tracker’ would start a new round. The performance consisted of six blocks made of 9, 12, 3, 8, 10, 4 rounds (fig. 2.27). As we performed, the rounds varied greatly in length, from 3 to 7 minutes, on average between 4 or 5 minutes. The effective engagement of the ‘workers’ was periodical, it consisted of one circumscribed action that was rather simple and quick. Once the performer did his/her part, there was plenty of free time to play with phone, chat, walk around, browse the literature, etc. After several warm-up rounds at the start, the linear progression of the score was through agreement sped up a bit so we started overlapping the rounds. This was spontaneous and decided on the fly, as it was simply too slow to wait for 4 or 5 minutes in order to perform something which takes only 10 or 15 seconds and than wait again. We were discovering and adjusting to a rhythm we could sustain. 3.51. office of ecological labour. Performance documentation, video still. Video: Louisa Love. 2 December 2014, Herbert Read Gallery, UCA Canterbury. As seen in the score above, the main activities had to do with data gathering, processing, marking. Different standard formats for working with data were used: accumulated area graph, a plot graph, and a spreadsheet. 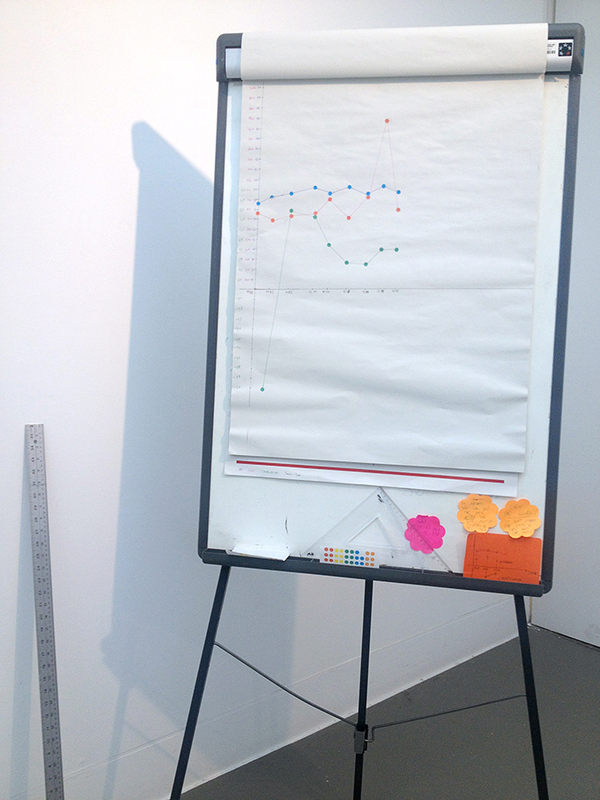 Graphing and plotting were performed by hand, emphasising manual labour. This, as any other activity in the performance could have been automatised and done by digital sensors, lines of code, printers, projectors, but we were performing sensing/printing/computing, together and next to some computers. 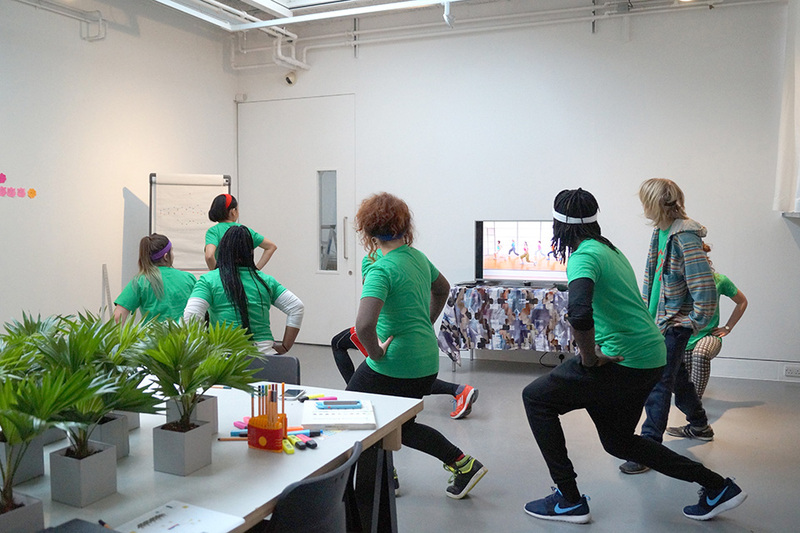 At the end of each block, the whole group performed an ‘outset exercise’, an activity intended to suspend the data tracking activity and invest us into the reproduction of atmosphere. The length of each exercise round corresponded to the number of rounds in that block, so, for example, after 12 rounds we ‘outset’ for 12 minutes. There were two possible modes of ‘outsetting’, and the choice was determined by the degree of correlation resulting from the previous measurement block. Correlation coefficient that we used ranges between -1 and 19. If the correlation was negative, we performed a ‘mindfulfillness’ exercise, we had to slow down more in the face of uncertainty (fig. 3.52). CO2 because or despite the decreased internet use, or, even weirder, the internet traffic was rising as the CO2 was decreasing. To process this, the workgroup sat and watched/listened to one of the mindfulness breathing exercises downloaded from YouTube. In case of positive correlation, we performed ‘aerodynamic’ exercise (fig. 3.55, 3.56). According to the data, that meant that indeed the internet traffic and the atmosphere were correlated, i.e. if the traffic decreased, the CO2 would start falling. 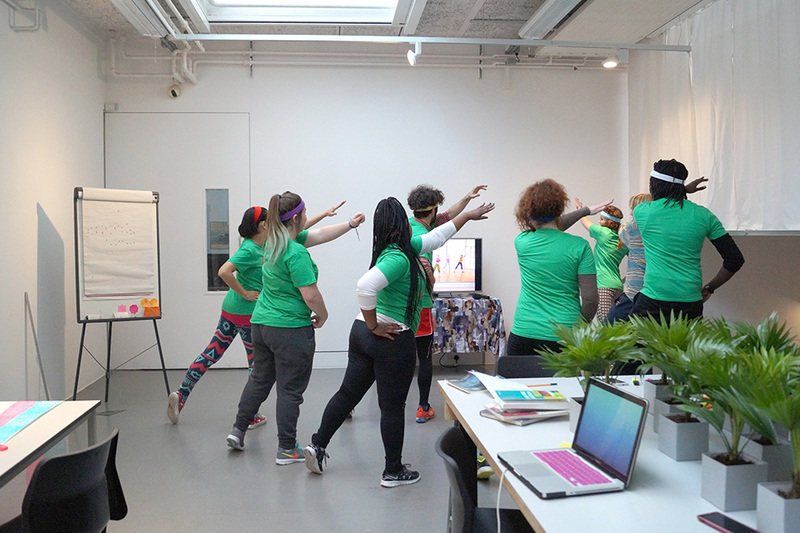 We followed a set of aerobics dancing exercises from the web, performed at a speed corresponding to the ratio of correlation10. Quite the opposite; here exercising is an intense entangling with the atmosphere, the more we exercised (and used internet less), there was a better chance that CO2 concentration would get back to lower level. Since measurements in either case did not go even close to -1 and 1, our exercises were always based on weak signs of correlation. 3.52. Mindfulfillness meditation, office of ecological labour. Performance documentation. Photo: Louisa Love. 2 December 2014, Herbert Read Gallery, UCA Canterbury. Beyond humans, the distributed architecture and infrastructure of the internet was doing its work11. The desk at the centre of the working space was also the site of gathering of a group of extra-human bodies. 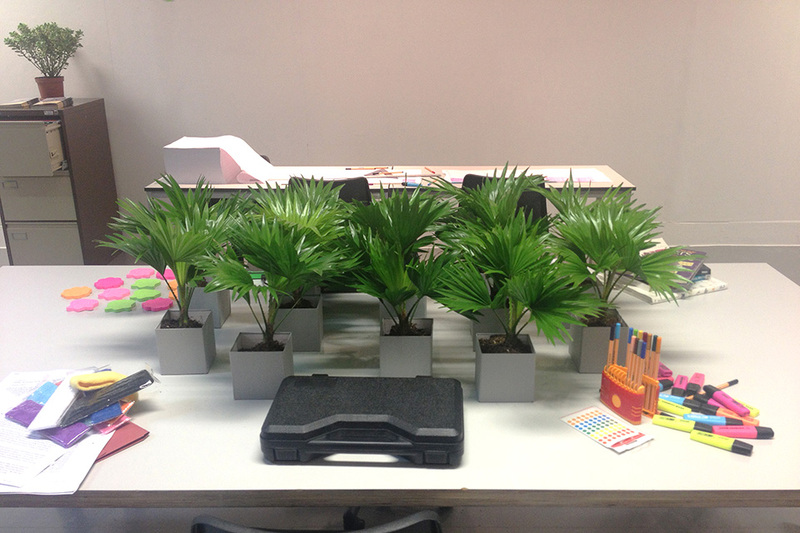 Occupying the central part of the table was a mini-garden composed of twelve Saribus rotundifolia or Footstool palms12. These palms were the silent part of the workforce in the performance (fig. 3.45). The concern of posthuman polytics—how to reassert and maintain autonomy of other-than-human bodies—was here acknowledged through vicinity but not interference. Instead of being brought into interaction with humans (beyond the breathing intra-actions), the plants withdrew into their busy world13. The autonomy of the other ubiquitous extra-human bodies―molecules of carbon-dioxide―was affirmed by the fact that the ‘CO2 gatherer’ was the only worker without a specific position (a chair), and was invited to roam about the space and ‘follow’ the molecules with the CO2 meter. Following the principles of contemporary creative work, contrary to the silent professionality of a stage performer, OOEL created a lively atmosphere. Chatting was ‘allowed’, as well as use of smartphones. 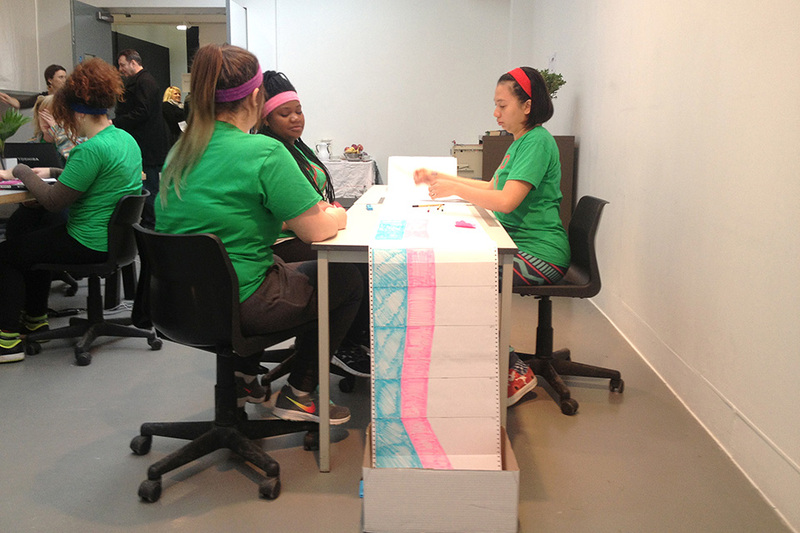 Throughout the piece, i engaged in conversations about the topics of the performance, and the participants explained the details to the visitors. One major decision that i took collectively with the participants was to swap positions after each round. Therefore, what at first sight may have turned out to be a Taylorist factory, became a dance between the fixed positions. By the end of the performance, everyone took parts in all the different stages of the process―tracking, graphing, tweeting, etc. Some participants had never filled in a spreadsheet before, or even tweeted, or plotted graphs, so these simple skills were learned on the go. More than an office obsessed with agonistic efficiency, performance looked more like a semi-chaotic laboratory or workshop. The result however was not ‘science in action’, but a prefiguration of posthuman intra-active knowing. 3.53. office of ecological labour. 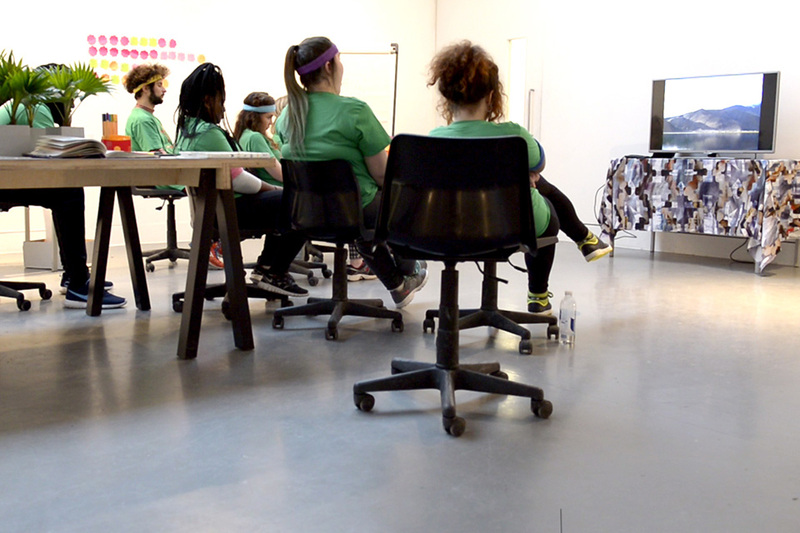 Performance documentation, video still. Video: Louisa Love. 2 December 2014, Herbert Read Gallery, UCA Canterbury. OOEL tried to enact a performativity of knowing in an expanded posthumanist continuum. The performance relied on the statistical tool of correlation in order to both trace its inherent limitations, and also to put it to unexpected, naïve and playful uses. The performance embraced various degrees of statistical uncertainty in order to become responsive to what we did not know, and to what is not ours to know, but that is known. This outside-within is all the inhuman knowings that support our world-making projects. The mere fact that the internet exists and ‘works’ is deeply entangled with the creativity and artistry of matter that has been able to self-organise itself, and keeps doing so. OOEL was a celebration of the creativity of the worlding projects that supports ours, but are rarely acknowledged and are mostly suppressed. From where we were ‘in particular’, with our bodies we attempted to intra-act with the atmosphere, the part we could touch and were touched by, and with a human-made information system, the segment with which we were involved locally. By doing so, we intensified the unsuitability/unsustainability of representational epistemology which thinks itself as separate from the bodies it refers to. The performance tried to reorient a statistical interface into a collective material-discursive bodily practice of in/determinacy. The in/determinacy is a property of how world ‘comes to matter’, not of a network or a body. Information and communication infrastructures, though currently disposed towards determinacy, because of their entanglement with multitudes of other bodies, are constantly in touch with chaosmic forces. How to co-perform with the wavering field of quantum forces (Barad, 2012), or DG’s ‘chaos’ (1994), is a question of commoning with the matterings/withdrawals of other bodies. DG claim that art begins with ‘enframing’, or ‘text/context’ in Derrida, a drawing up of a territory from chaos. However, it is chaos or context that affords the creation of the territory, it supports the practices that happen inside the frame. How to render justice to this generosity of the universe is a question of posthuman commoning. Capitalist-informational apparatuses are worried about extracting meaning and power from the buzz of liveliness. By doing so, they background and suppress the very possibilities that make them possible. This is primitive accumulation at heart of informational industries of the day. In order to do differently, to create more just apparatuses both for human and extra-human bodies, instead of consistency and (cyber)security, apparatus must be turned away from itself. Through the withdrawal on the level of the apparatus, of its boundary-making cut, it renders itself open to the indeterminate. Indeterminate here stands for what other bodies know, possibilities of becoming that are either suppressed or merely withdrawn in the apparatus. Earth others know things that human-made apparatuses cannot fully understand, but this indeterminacy is co-constitutive of any human worlding project. Making informational apparatuses response-able to the earth means taking in the affordances of matter and dispersing the power accumulated. This is how human worldmaking projects may participate in ‘more-than-human sociality’ (Tsing, 2015), by supporting other bodies’ freedoms that we ourselves have been allowed to experience through, in this case, world-wide connectivity. The internet entangles earth, atmosphere, human bodies in unprecedented ways, and with this comes a radical responsibility and accountability. With a relentlessly critical eye on capitalist projects that screen and harness this reality, absolute hospitality of the universe is a reason for joyful affirmation. The world has already invited us to make more-than-human commons, the human body is already proof of this artistry (Grosz, 2008) or nature’s creativity in ‘writing itself’ (Kirby, 2011). 3.55. Aerodynamic exercise, office of ecological labour. Performance documentation, video still. Video: Louisa Love. Being implicated with modern technology means occupying earthly territory far and deep, but there are different modes of inhabiting it. One seeks consistency and power, the other one faces the indeterminacy. To me it seems that the second one is closer to the dynamics of matter and life. We are already multiply entangled with bodies we do not even know of, how to dissolve and disperse the powers accumulated through theirs and ours asymmetrically entangled efforts is a question of collective mattering/withdrawal. From the standpoint of the user or participant in the technological apparatus as powerful as ICT is now, these accumulated power need to be pulled away from themselves, to afford the possibilities of the universe to trouble the apparatus, to regenerate possibilities for bodies to come to matter, for me to write this text. Matter has been making itself more response-able to humans than the other way around, but this absolute hospitality can be exhausted. Exhausting the material possibilities of human and extra-human bodies that keep us going means, of course, decreasing the possibilities of life for the bodies that exhaust. The internet, because of its marvellous multiplicity of inter-bodily folding, has a potential to be re(con)figured into an apparatus that regenerates earth, a territory of the making of posthuman commons. This tension between extraction of life that takes place through information and communication technologies and how to invert and revert this process is one of the ubiquitous boundary-making protocols that, in my view, environmentalism and eco-oriented art practices should account for. 3.56. Aerodynamic exercise, i. Performance documentation, video still. Video: Louisa Love. Power use of Information and Communication Technologies (ICT) is occasionally debated in press, and a certain amount of research has been done. One of the oft-quoted estimations is that the energy use of the internet was 8% in 2012 (in De Decker, 2015). The problem with the estimates of ICT energy consumption is mostly what they include and what they leave out from the calculus. Manufacturing of the ICT devices is rarely included, as well as power used to charge portable devices. Further, it is often said that the internet service ‘substitute’ more energy demanding offline services, e.g. ia videoconference “takes at most 7% of an in-person meeting” (in ibid.). However, these numbers should not be taken at their face value as they are more or less fine estimates, and they differ to order of magnitude from one another. De Decker rightly insists that increasing power efficiency in manufacturing and data handling are sometimes offset by consumption patterns. More and more devices are bought, and more and more data is used. A report The Cloud Begins with Coal by Mark P. Mills, published in August 2013, attracted attention in mainstream news by claiming that an iPhone consumes more than the latest generation of refrigerators (a claim which was fiercely contested) (Walsh, 2013). Beyond accounting merely the current energy use, what is more startling are future predictions, as the ICT sector is the fastest growing economic sector in the U.S. and wider. A recent report by Greenpeace claimed that data centres, or cloud computing are the main drivers of the energy use (Cook, 2012). Considering that Mills report concluded that the main energy source of the ICT sector is still coal, this indicates that ‘the cloud’ has deep affinities with the unsustainable economic patterns. The energetic unknowability of the internet resonates with the epistemic opacity of the stock exchange, and, in particular algorithmic high-frequency financial trading. To date, no one was able to determine the exact causes of the Flash Crash on May 6, 2010 at 2,45pm on Wall Street (brilliantly documented in Marije Meerman’s documentary film Money & Speed, 2012). Apple has in 2013 published reports showing that their data centre efficiency has reached 100%, while Google publicises their continual energy efficiency improvements and greening of their energy mix, as well as holding a symposium about the topic in 2013. However, this is but a fraction in the much larger sea of internet infrastructure covering the globe, and small and medium data centres are the lion’s share of energy use. According to some analyses, switching over to the cloud would dramatically reduce global energy consumption related to the ICT (Kanellos, 2013). Perhaps one of the internet’s futures, after all, is a certain centralisation, which makes the discussions about property and location of the internet infrastructure even more important. The fact that divorce rates in Maine are positively correlated with per capita consumption of margarine in the US does not mean that they are causally co-implied (one of the many hilarious examples from the website Spurious Correlations). Take, for example, the case of ScanOps, the unit of Google that is assigned the task of scanning digital books. Sometimes fingers of these workers appear on the scanned pages. Their working conditions are dubious, as Andrew Norman Wilson, a former Google employee, documented in his works Workers Leaving the Googleplex and ScanOps. They are the carnal infrastructure of the big data engines. “The term ‘digital divide’ refers to the gap between individuals, households, businesses and geographic areas at different socio-economic levels with regard to both their opportunities to access information and communication technologies (ICTs) and to their use of the Internet for a wide variety of activities.” (OECD, 2001) Digital divide is often measured on the country level, but, i believe, in the above context, it has molecularised and penetrated social tissue at large. Crowdworkers are in the North and in the South. The Internet has probably dissolved these grand geographical labour divisions for good. In the exhibition abstract, Brasó writes the following ideas, which was the beginning of the performance development:[blockquote]Inefficiency can be understood as an effort without reward; as the negative result of a system designed to produce a benefit, to be profitable. In relation to present conditions of labour, the dialectic of efficiency/inefficiency is at the core of new working paradigms. From life-hackers who propose efficient uses of technology to minimize the time spent at work, to the vindication of sleep and its power to resist capital’s constant demand of attention, and from the rise of the artist’s job –self-motivated, flexible, unstable– as exemplary, to the reliance of many creative industries on the exploitation of unpaid work (internships), labour is today intimately connected to debates around (in)efficiency. (2014)[/blockquote] If not efficiency, what else? Georges Bataille’s notion of ‘general economy’ was based on ‘excess’, dispensation of surplus energy that every organism and social system produces (1988). This is a striking idea in times in which austerity is one of spectres haunting large parts of Europe. I relate more to the discourse of exhaustion (not scarcity) both of human bodies, as well as the earth (e.g., Brennan, 2000; Berardi, 2012). Excess and exhaustion do not exclude each other, as exhaustion from capitalist labour may open affective territories for exuberant performances of affirmative affect. For visual score, see fig. 2.25. In the project we used the Pearson product-moment correlation coefficient, which indicates linear correlation between two variables in the range between -1 and 1. 1 is a total positive correlation, which means that both variables rise or fall in sync, 0 means that there is no correlation, and – 1 is a total negative correlation, i.e. when one variable rises, the other decreases, or vice versa. The aerobics videos were played at one of the three different speeds: 0.6 (slow), 0.75 (medium), and 0.9 (fast) of the original. If the correlation was 0 – 0,33 we would dance to the slow version of the video, if it was 0,34 – 0,67 the video was played at medium speed, and so on for the upper echelon of correlation. In the initial draft of the project, i planned to include the ICT infrastructure into the installation, placing one of the University servers in the gallery. IT department of the University dismissed this possibility, so the internet infrastructure remained in its (invisible) place, which is in effect the usual state of things. Beyond its excellent air purifying capabilities, footstool palm’s rich foliage is the unofficial symbol of the Philippines, which is an important nexus in the production of IT components and circuits, as well as global networks of labour migration. In the initial drafts of the performance, which were outlined before counting live stock(s), the palms would have a number of light sensors (the interface used in dancing ecologies). In this scenario, the performance would have triangulated the internet use, solar power (corresponding to the degree of photosynthesis), and CO2 concentration. In view of the encounters with sheep in Zlatibor, i have grown convinced that palms are already doing more than enough, and there was no need to extract anything more from them. They did not need a (technologically mediated) voice, they were already fully expressing themselves in their own molecular biospheric-atmospheric entanglements, and other ways less known to us.